Whilst I was on duty in Chichester Cathedral a couple of days ago, I was chatting with the erstwhile head guide – a fount of all knowledge. He mentioned the hedgehogs in the North Transept, as if I was well aware of them. So I had to come clean and admit that I’d never seen them! I often feel that I go around the world with blinkers on, never noticing things that suddenly jump out at you as soon as someone else mentions them! Well hedgehogs are fairly common in heraldry and in this case the explanation for them was pretty clear. 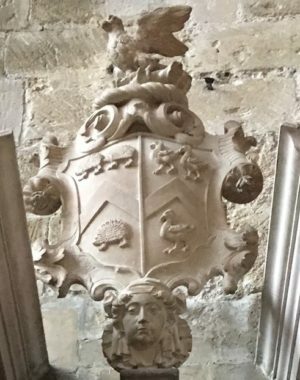 The memorial that I was sent to look at, was of somebody called Rachel Harris, wife of George Harris, an Alderman of Chichester in the 18th century. The heraldic symbol for the surname Harris is three herissons. This came about because the English surname Harris is a derivation of the Norman name Herisse. The translation of the French word herisson is hedgehog! So symbolically the heraldic interpretation of the surname Harris is the hedgehog. I have no idea why three hedgehogs are required though! That’s the next question I will need to ask!! They are very cute though, aren’t they!